Trim makes a big difference in the finished appearance of your painting project; it includes your baseboards, moldings, chair rails, and cornices. Whether you choose to paint or stain, it should be properly prepared to make sure that you’ll achieve the look you’re going for. Read on to discover how to paint trim like a pro. Before you get started, you’ll want to start with the preparation stage. This ensures that your paint or stain choice will adhere to the surface in a smooth way. Sand the surface of your baseboard, moldings, or other surfaces with a palm sander or random orbit sander. Remember to sand with the grain and to change out the sandpaper as it wears down. Next, clean the surface of all leftover dust particles with a soft, damp cloth. Use wood filler and a putty knife to slightly overfill nail holes and sand it smooth when dry. A brush is the most ideal tool to use for priming and painting your trim. Use long strokes along the length of the trim rather than up and down. For the most durability, use a semi-gloss or satin finish. 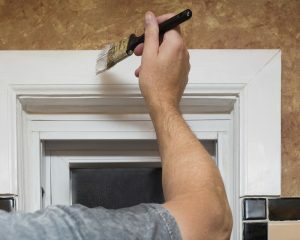 For bigger projects, when you’re painting walls in addition to the trim, start with the trim first. That way you’ll be able to sand and prepare the trim without damaging any new paint on the walls. Once you’re finished, use painter’s tape to cover the trim while you work on the walls with a roller. After preparing and priming your baseboards, moldings, or other trim surfaces, use an oil or latex enamel paint for your topcoat. Use a higher sheen for these surfaces to combat the amount of physical contact they take from furniture, shoes, and other bumps. A high-sheen surface will also highlight those unique architectural design elements of the trim, creating more visual interest and contrasting appeal. Satin paint displays a light luster, soft texture, and great durability.